Two versions of a very similar toy! The Centipede Horizontal (pictured above left) is hung on nickel plated welded chain, has a paper rope center that is filled with lots and lots of colorful paper rope knots, some pony beaks and couple wooden pieces for added chewing fun. There is a a nickel plated quick link for easy hanging. The Centipede Vertical (pictured above right) has no metal and perfect for birds that tend to be metal sensitive! 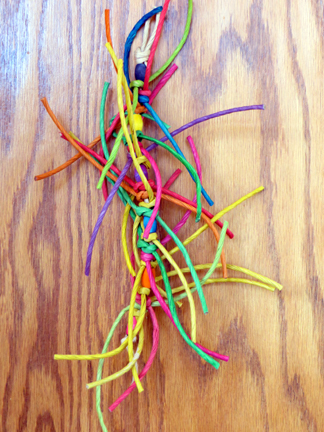 The center is paper rope, with lots of knots of colorful paper rope, separated by colorful wooden beads. 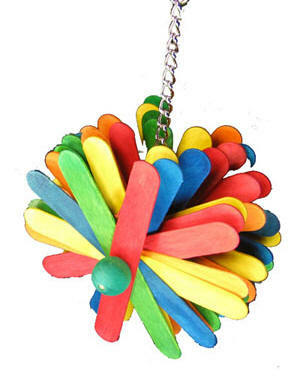 These are great for those birds who love to preen and tongue their toys ... sized for smaller to mid sized sized beaks in your house!